The post was originally published here on April 13, 2015. I’ve since updated the photographs and text. I’ve talked about my general dislike for eggs many times. I know, I know. It’s shocking. Deep breaths, everyone. I’m trying to adjust my palate so I can enjoy eggs more. But it’s slow going. So far, I’m still mostly into eating eggs that are baked into brownies and cakes. Or those that are heavily disguised with lots of cheese, vegetables and bacon. So, what does a food blogger do for Easter when just the mere thought of deviled eggs makes her want to run in the other direction? She makes stuffed avocados! Avocados TOTALLY look like eggs, don’t they? I must admit that I never really noticed the resemblance before. But now I can’t unsee it. All the cuteness of eggs, without all the taste. That’s a win for me! 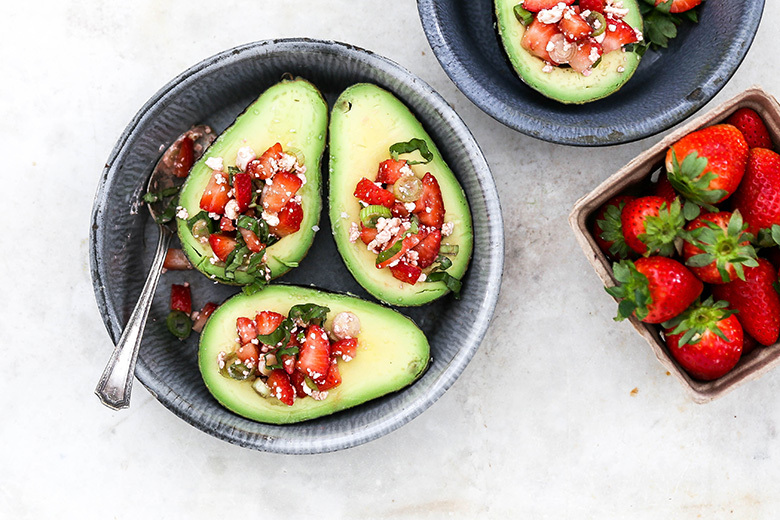 These Baked Avocados with Strawberry Salsa would be SO PERFECT for a Spring brunch or party. I love the individual serving size. And you know how excited I get about edible bowls! 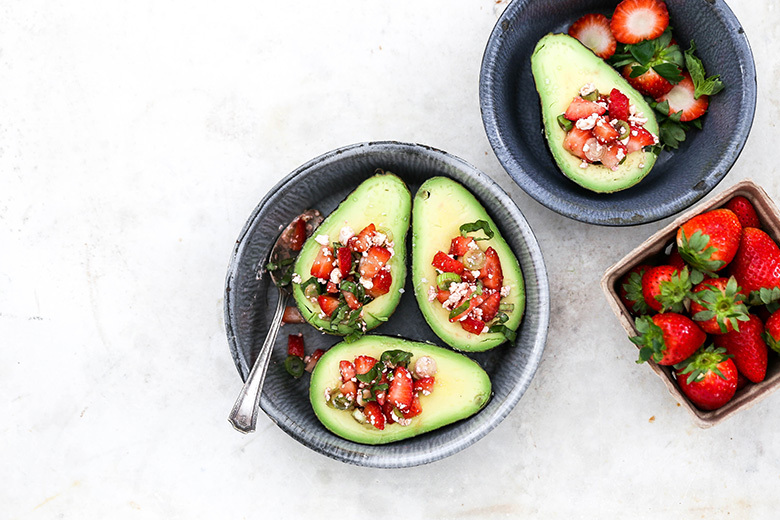 You can eat these Baked Avocados with Strawberry Salsa with a spoon. Or dig in with some chips. I also like putting a whole half on a plate of lightly dressed arugula for a salad that’s worthy of entertaining. You’ll definitely get a lot of presentation points with these babies! Cut each avocado in half and remove and discard the pit. Place the avocado halves flesh side-up in a baking dish. If the avocados won’t remain upright, you can create a flat surface for them to rest on by slicing off a small area (about the size of a postage stamp) on the backside of each avocado half. Rub a thin layer of olive oil over the flesh of the avocados. Then transfer the baking dish to your pre-heated oven and bake the avocados for 8 minutes. Meanwhile, in a small bowl combine the chopped strawberries, sliced scallions, goat cheese, basil and balsamic vinegar. 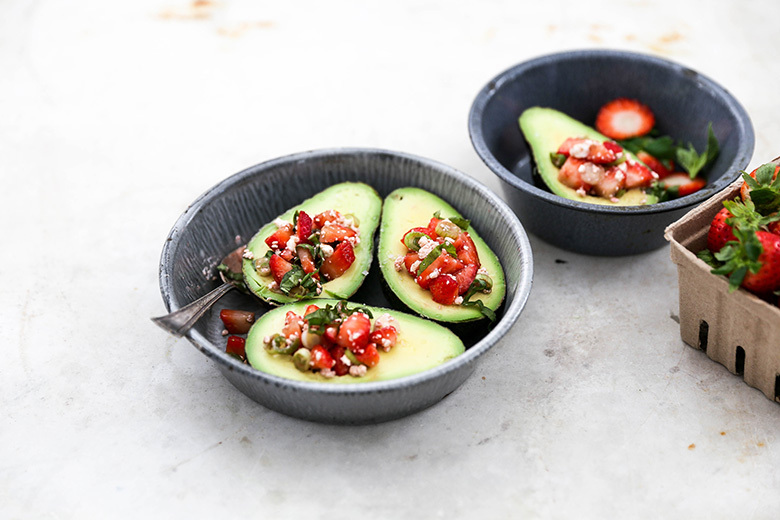 Remove the baking dish from your oven and spoon some of the strawberry salsa into the cavity of each avocado half. 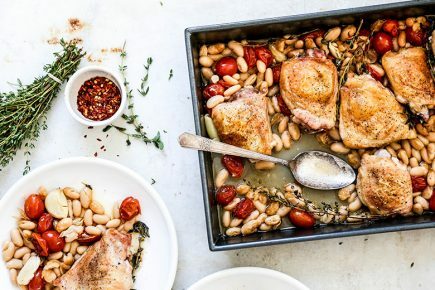 Return the baking dish to your oven for an additional 2-3 minutes. Remove. Sprinkle the tops of baked avocados with a pinch of salt. Serve while still warm. Oh yes. We will eat the heck out of these bake avocados when you visit! Wow I love this, Liz! 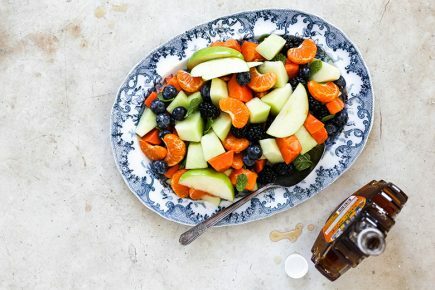 I just made a salad using avocados, but never thought to make them with fruit. Genius! Sounds so delish! Thanks, Gayle. I think you’ll love this! Totally. I’m SO tired of dishes! Yaaaaay I’m so happy to hear you all had a beautiful weekend! Popsicles for breakfast? I’m jelly! I’ve heard marvelous things about baked and grilled avos and have yet to try it! I could eat about a dozen of these avos with strawberry salsa – so fresh and tasty! So nice to finally have good weather. We deserve it! You gotta get on board with the baked/grilled avocados. I know you’ll love them! I totally ate mini frozen cheesecakes for breakfast this weekend without any regrets. So, I hear ya on the popsicles for breakfast! Why am I not on the baked avocado train yet? I’m definitely using tortilla chips to dish out these yummies. Oh get on that train. You’ll definitely enjoy the ride! Glad you got some good weather! Really starting to feel like spring, huh? Ok, howwwww have i never had a baked avocado? I must try this! You gotta do it, Natalie! Yes to no dishes! These are so freaking cute, gorgeous and all around perfect! I am here to join the anti-dish revolution! 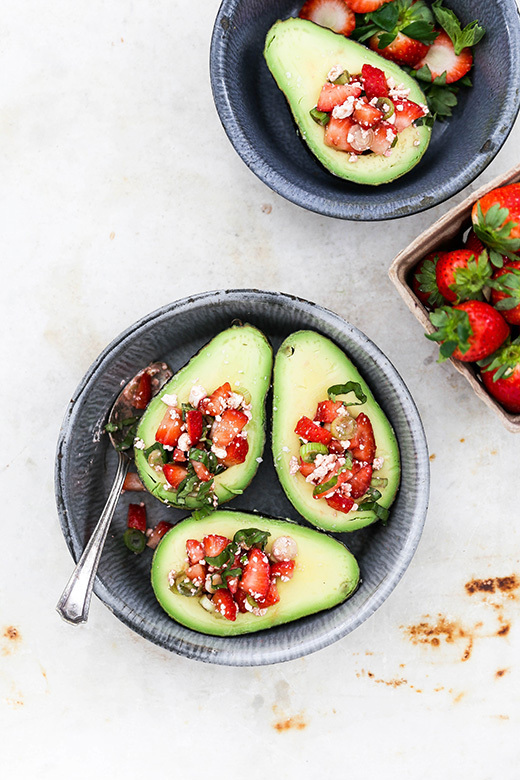 These baked avos look amazing and I love all the flavors- strawberries, balsamic, basil, goat cheese.. wow! NO MORE DISHES! Let’s start a FB group or a Pinterest board or something. All dedicated to recipes without dishes! Liz!!! I freaking love these!!! Just yesterday, I poured balsamic dressing in my avocado half and ate it with a spoon. . I love this so much!!! Trying this!!! this is brilliant! Awww…thanks, Alice. I know you’ll love ’em! I love sunny weekends! I’m so happy you had such a great one, Liz! This is SUCH a great and fun idea to highlight strawberries! Just brilliant! Thanks, Justine. Sunny weekends are the best! I loving the warm weather! It was so nice to open up the doors and windows. This avocado strawberry salsa makes such a beautiful presentation. I’m loving the combination of flavors! Yes! I opened all the doors and windows and let in the fresh air. It felt incredible! I think we should do a girls weekend to go visit you. I’m loving all your photos that you posted. Now I’m all for this strawberry salsa. Liz!! These little cups of heaven sounds completely divine. So happy spring has arrived in New England! Meeee tooo! Spring has finally arrived and it’s glorious! Miss you and can’t wait to hear all about your new place! 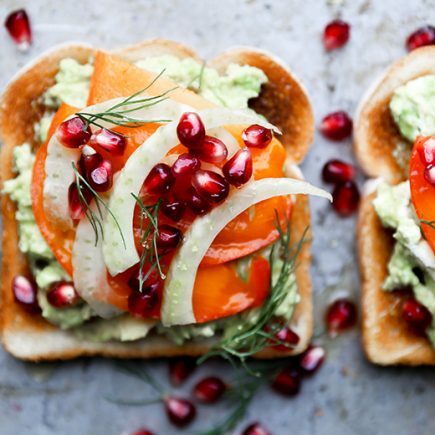 I totally eat avocados for breakfast…mainly in avocado and fried egg toast form, but i’m up for switching it up with these beauties! Can you believe I still haven’t tried a baked avocado!? Need to change that stat! Thank you, Marcie. And thanks for pinning! These are absolutely adorable! I love baked avo and stuffing them with strawberry salsa sounds amazing! Such a great idea! Thanks, Kelly! I hope you try them out! So pretty! This is such a genius idea, and I need this in my life…just like I need more of Liz in my life. Let’s go jogging and eat popsicles…except can we just skip the jogging? Ha ha! I love how you think, Connie! I love making salads with avocados and strawberries, but never thought to make them like this! Such a great idea! I can just eat avocados plain, they’re so good. They are my fav. I’m eating them like crazy lately! Ha ha. Glad you’re obsessed. Because I’m obsessed too! These are seriously amazing! 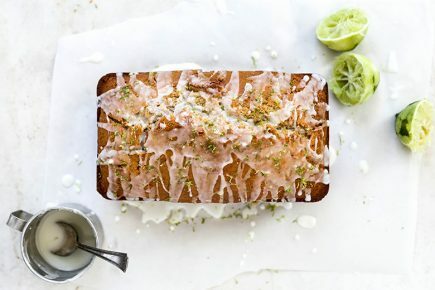 I eat avocados with strawberries and goat cheese all of the time but never thought to bake them. Love that idea! Thanks, Ashley! I totally thought of you when I posted these. They are right up your alley! haha I definitely over-buy foods sometimes – when I get all excited they are back in season or on sale! But one can never have too many avocados! 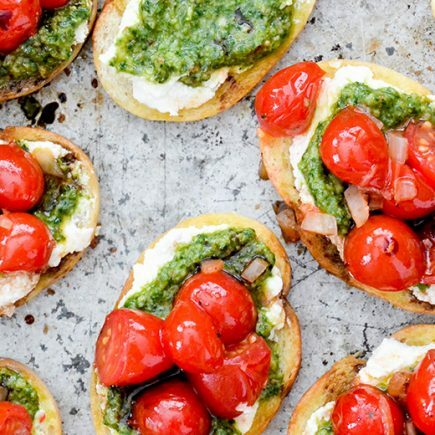 These look fantastic with the strawberry and goat cheese! Glad I’m not the only one with isn’t very good at shopping sometimes! I hope you try them out, Ashley! I am the worst with avocados! I always have the best of intentions, but by the time they are ripe, I have forgotten about them. This looks like such an awesome way to use them up! Love the strawberry/avocado combo, it is perfect in a salad and bet it is perfect in…boat?…form! Yeah for “boat” form!!! Thanks, Denise! Amazing blog, I have only just found it. The colour in these photos are breath taking and the flavour combos sound so strange, but I think would taste amazing together. A bit of sweet and a bit of salty. I’ll have to try this when I have an avocado sitting there with nothing to do. Hi Sophia! I’m so glad you found me and you’re enjoying the blog and the recipes! Thanks for being a fan. I hope you try the avocados! 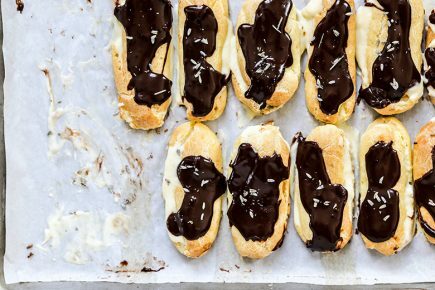 Oh my word… this recipe sounds absolutely sensational! Not to mention beautiful. 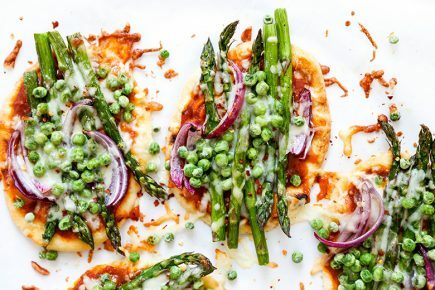 Thank you so much for sharing… I’m looking forward to seeing more of your creative recipes! Why thank you for the wonderful compliment, Eunice! I really appreciate it. I hope you enjoy the avocados! Thanks, Michele! I hope you try them out! SO glad you updated this post, Liz… seriously, I wouldn’t have known! 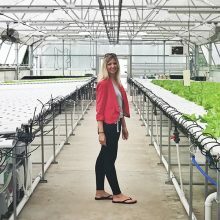 I tried strawberries and avo last summer for the first time and was blown away! Now, avos doo look like eggs… how about that? I love eggs, Liz! I hope your easing into them goes smoothly! Yeah one foot in front of the other, right? Lol.